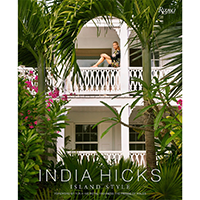 India Hicks: Island Style is a beautifully illustrated guide to achieving her famously undone, gloriously bohemian decorating style. Born from British and design royalty, India Hicks has forged a design empire from her family’s enclave in the Bahamas. In India Hicks: Island Style, she invites readers into her world, offering never-before-seen imagery and irresistible behind-the-scenes stories.